H-366T is designed to transmit audio signal of TV, DVD, MP3 etc. to Bluetooth receivers, earphones or speakers by the Bluetooth wireless technology. To help customers to realize a higher quality wireless household lives. Welcome to chose our Bluetooth receiver to get a better experience of listening. What’s more, it will make it being available for you to set up your personal pairing password to enjoy a safer and steadier connection by using our Bluetooth transmitter & receiver combination. Easy operation, connect the product with audio players by a audio cable, without set up after the device turn on. Exquisite round design with perfect process, mini body, more smaller and lighter. Multi-point design, one transmitter could connect with two Bluetooth devices at the same time, eg. one BT speaker and BT headsets. High quality stereo transmission makes sure you can enjoy the auditory feast. After the power is on, one of the blue lights flashes slowly, showing that the connection restoring mode is entered. In his mode, the Bluelooth devices connected previously will be connected automatically. 1 g seconds of the stadup, two blue lights wiil flash quickly in an alternate way, showing that the paring mode is entered and a new Bluetoolh device wilt be searched. One of the blue lights is constantly on, showing that one device is connected. The other blue light flashes up, suggesting that the second device is being searched. 20 seconds, the search will stop automatically when the blue tight stops flashing. If you want to pair the second device again, you need to press the power button gently to enter the search mode. When the two devices have been connected, Ihe two blue fights will be constantly on. Third step: Have a long press on the power button for 2 seconds. (Unit size：45mm*11mm). Small, lightweight and durable . 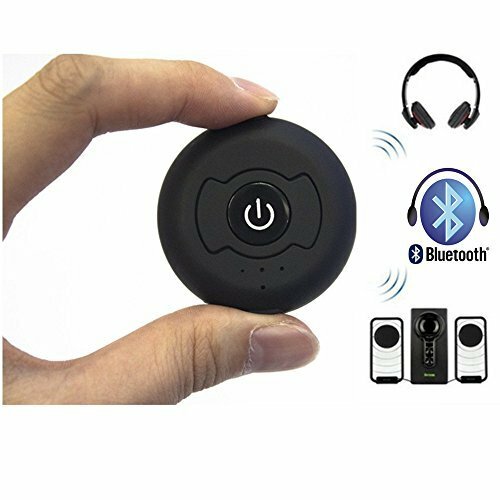 High performance Bluetooth 4.0 (High-Fidelity) with A2DP for enhanced audio quality, allows you to enjoy the stereo music without wire restriction or watch TV quietly (not for answering calls). Work with any type and brand of device such as TV, PC, CD player, iPod, Kindle Fire, MP3/MP4 etc. up to 30 feet working range. Easy pairing with Bluetooth stereo headset, headphones, speakers and other Bluetooth stereo audio enabled system. This one A wireless transmitter with excellent battery life, to 5 hours of play time. with dual mode, you can use it plugged with AC adapter without worrying about the battery.